*Due to the custom nature of this item, it will ship in 2-3 business days. Stainless steel dog bowls with your dog's name. Choose from a variety of colors, fonts, and designs. Durable outdoor grade vinyl designs, custom made by The Dog Outdoors's own Jenny Daughtry (my creative wife). See the step by step bowl building process below the overview video. Custom designs & company logos also available upon request. Choose a bowl size from the 1st dropdown box at the top of the page. We currently carry 16, 24, 32, 64, and 96 ounce options. See the picture below for a reference on how big each size actually is. 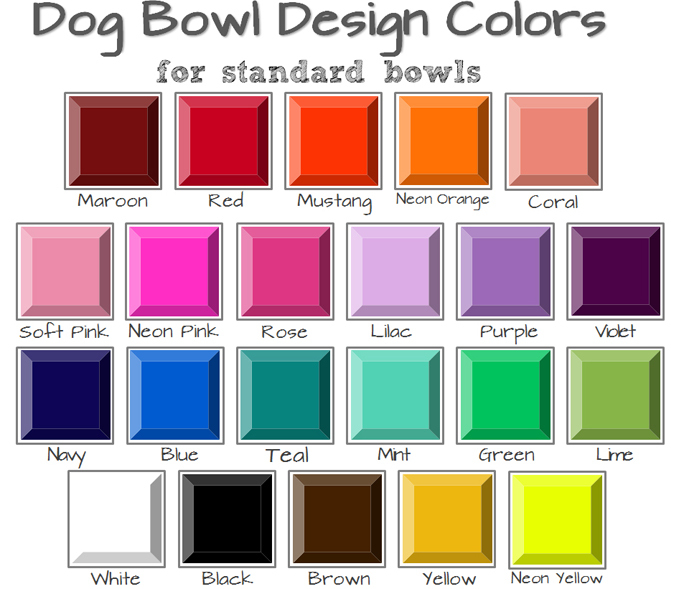 **For customized bowls: Choose the "custom" option in the style drop-down box and describe what you would like in the "comments section" during checkout. We will follow-up with you to discuss options and can send a draft version for review. Custom bowl designs will be $5 extra. 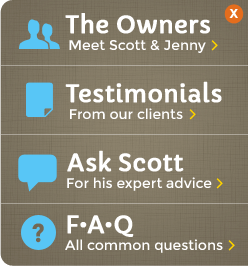 Type in your pet's name in the text box at the top of the page. Enter a maximum of 12 characters. We will contact you if your pet's name is too long for the design you choose. These bowls have been tested as safe for the top rack in the dishwasher, but we recommend hand washing. The durable material used for your dog's name is specifically made for outdoor wear and use. Once attached to the bowl it becomes virtually seamless and should hold up great over time. I've always loved making gifts for my loved ones. I feel like its especially meaningful when its a personalized gift. That's why we've brought on these personalized stainless steel dog bowls. They're durable, easy to clean, and absolutely unique. Each dog bowl will be custom made: designed, created, and processed by myself. 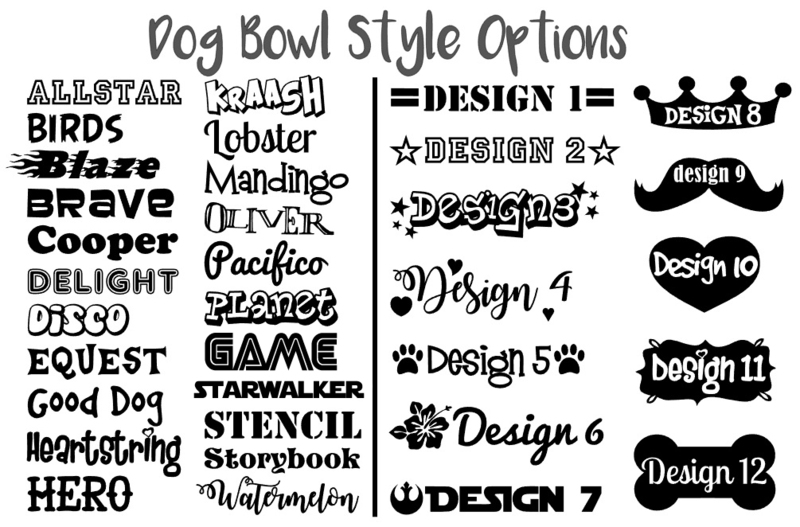 I've tried my best to offer a large variety of fonts, colors, and designs but I always enjoy a challenge so please don't hesitate to contact me at jenny@thedogoutdoors.com if you have a special dog bowl design in mind. Maybe you'd like a specific dog breed on there or a college mascot. 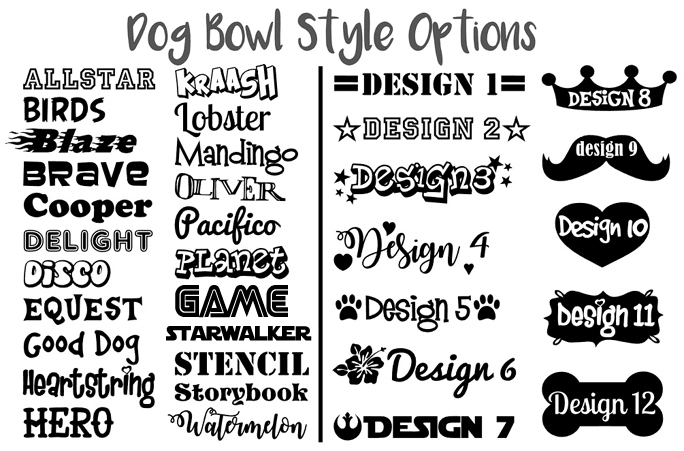 Any of these requests can be initially submitted by email and I will make sure you see a draft before completing the customized dog bowl. You can also tweak the existing designs above by, for instance, changing the "Design 11" font to "Hero", or the "Design 5" font to "Disco". A custom request like this can simply be stated in the comments section during check out. Every dog's personality is different so they should each have their very own special custom dog bowl! 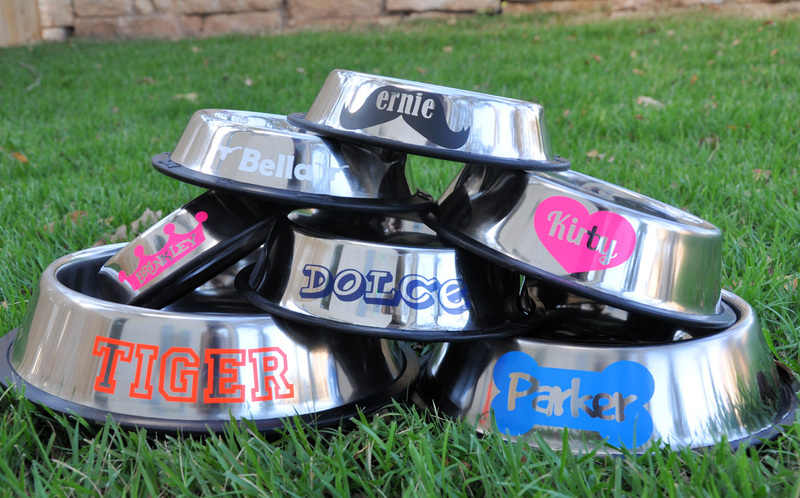 Which personalized stainless steel dog bowl is right for your pup? Choose a bowl size from the 1st dropdown box at the top of the page. We currently carry 16,24,64,and 96 ounce options. See the picture below for a reference on how big each size actually is.